Good morning friends! 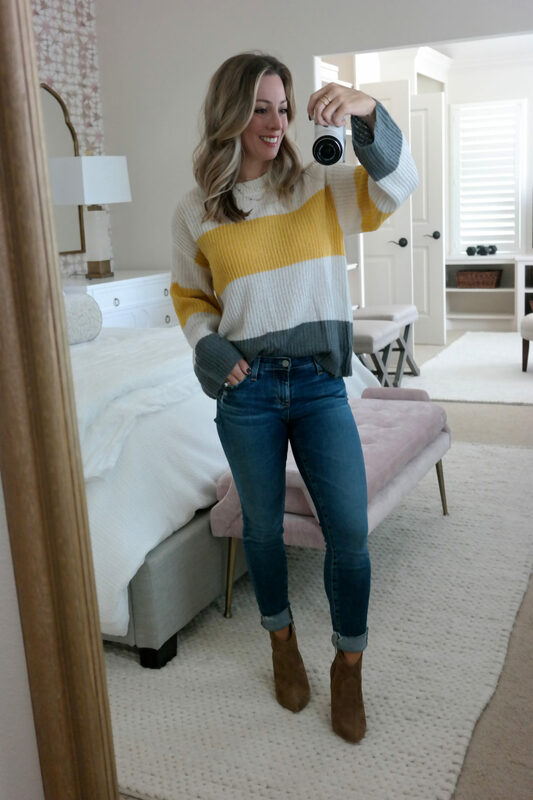 You might have heard the Nordstrom Anniversary Sale opens to everyone tomorrow!! Get ready!! 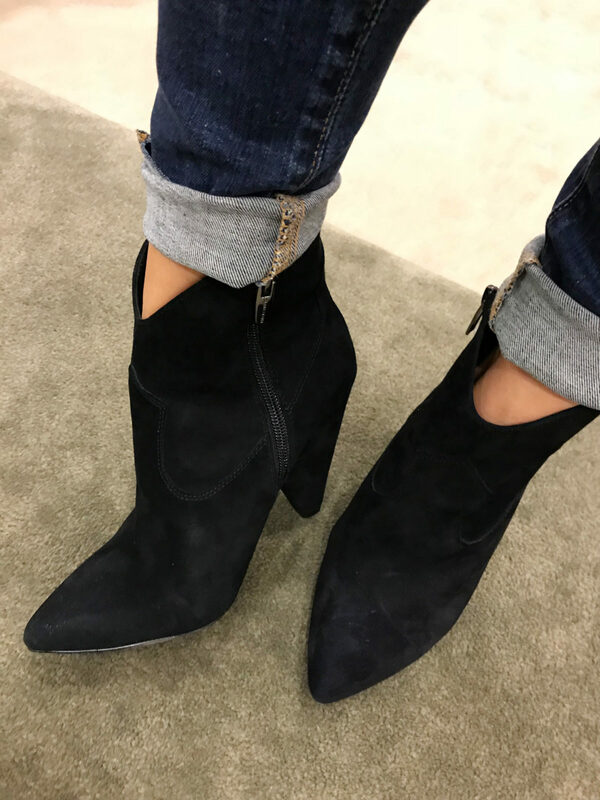 Today, I’ve got your ultimate Nordstrom Anniversary Sale shoe guide to the best boots, booties and sneakers in the sale! 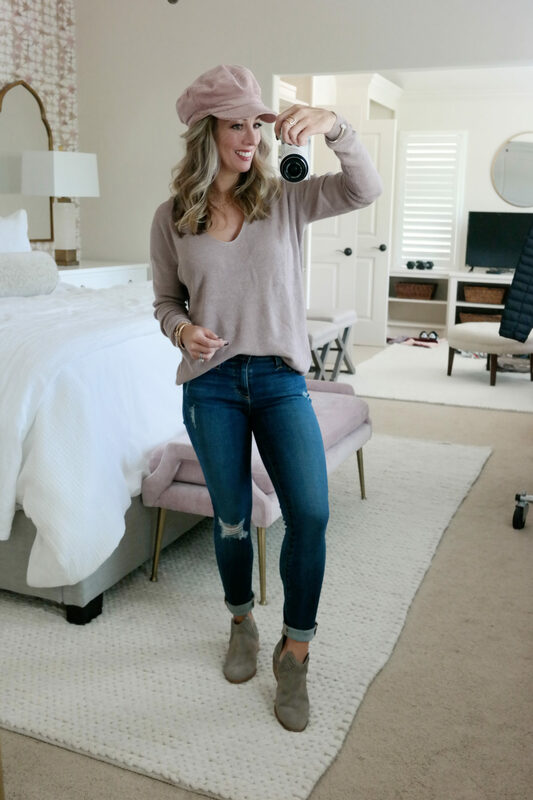 I wanted this post to be extra helpful for you when narrowing down your shoe choices, so I provided details and fit tips along with a styling option for each so you could see how the shoes look on. 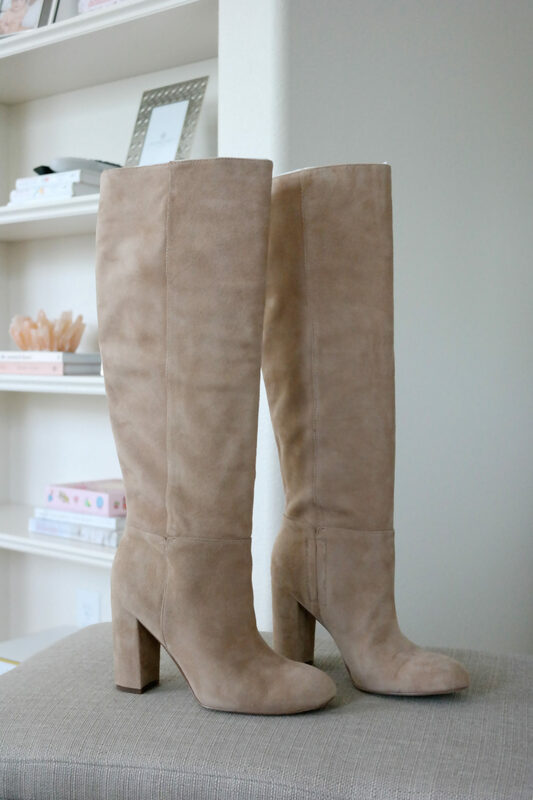 If you want a new pair of boots this year, but are only getting one pair, I’d recommend a taupe bootie. 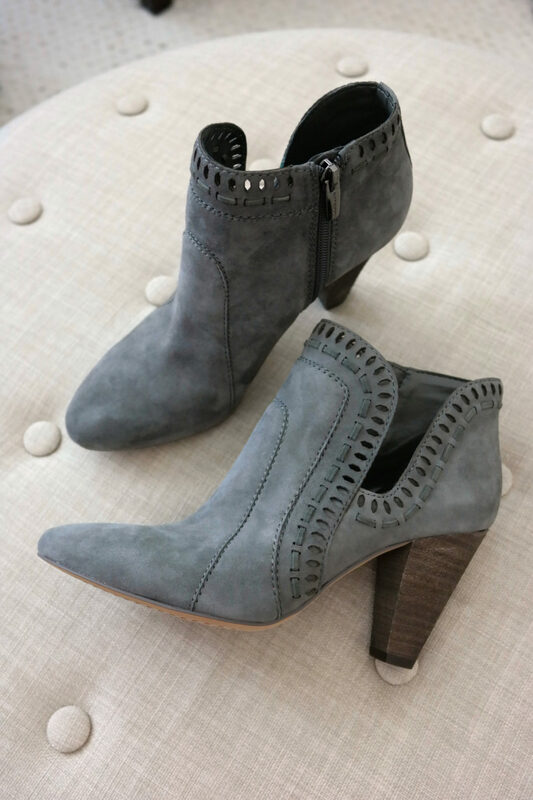 Taupe will go with everything in your wardrobe and a bootie is universally flattering with jeans, skirts, and dresses. Pick a heel height that you can comfortably wear- I’ve got several height options below. FIT : Runs big, size down half. Wide width offered. DETAILS : This was my favorite low-heeled, almost flat bootie in the sale. It’s got a rounded toe and moto inspired stitching on the sides with a cute cutout to show some ankle. If you want to wear socks, a low profile or ‘no show’ sock will still work and be undetected. The “foxy suede” is closest to taupe and a great neutral. DETAILS : With a cone heel, slightly pointy toe and dainty perforations, this bootie is super stylish. I like the side cut for showing off some ankle, and again, a low profile sock won’t show. The black is also stunning, but the caramel was too orange for my liking. FIT : I sized up half because they run narrow. 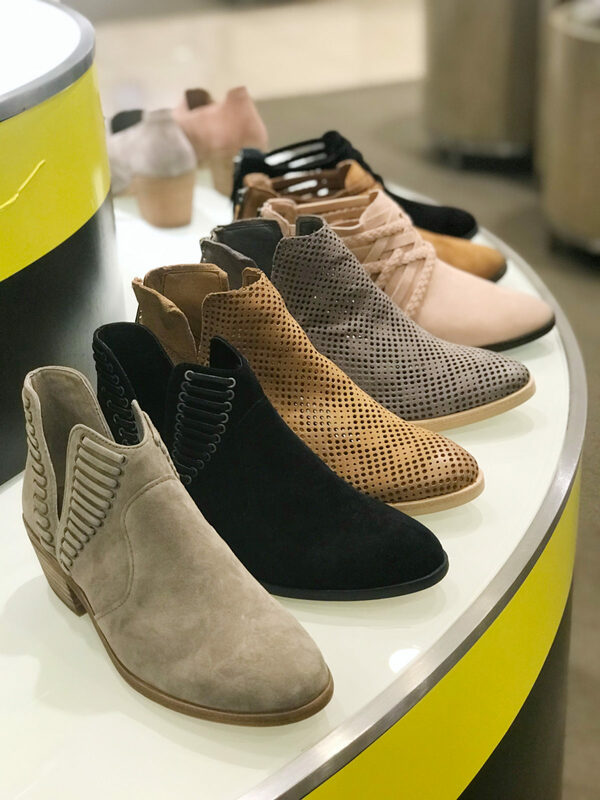 DETAILS : This cone shaped bootie with a v-cut front made my list of “Must Haves.” That little V is magic for elongating your leg line and letting a little bit of ankle peek through. They are flattering on everyone, but especially on us shorties. I bought them in black and tan. They’re also quite comfortable and the cone heel is fashion forward. DETAILS : If you want to go a little daring with a 4-inch stiletto heel, this bootie is exquisite! Although the ankle is slim, it’s still easy to walk in if you’re used to walking in high heels. They are super flattering and help elongate the look of your legs. DETAILS : I had to show a peep toe bootie and this perforated one with front rusching is a great wear now and later shoe. The block heel makes it quite comfortable and it easily zips open on the side. My in-store photo didn’t do the color on these shoes justice, because they are all beautiful! 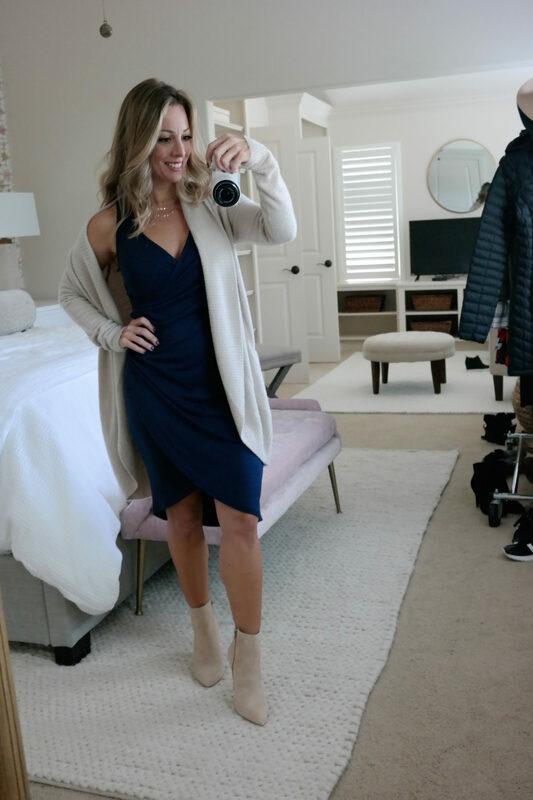 I especially like wearing peep toe booties with dresses and skirts because they have that light and airy feel, as opposed to looking heavy. FIT : TTS, the boot hits me right mid-knee and I’m 5’1. 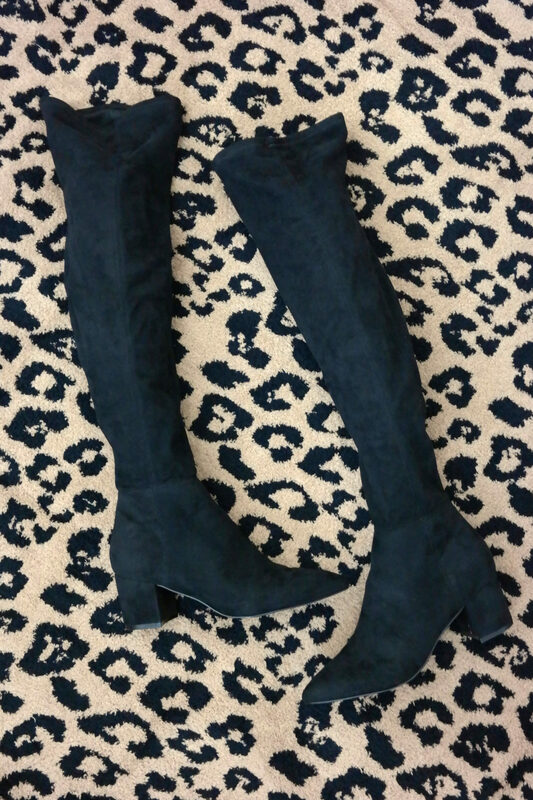 DETAILS : I was lucky to get these Sam Edelman Caprice knee high boots in my size before they sold out! My store only had one size 6 in the store left! They’re perfect not only with jeans, but also leggings and dresses. I love the light neutral color that will go with so many things in your closet. The style is clean and unfussy, with a block heel that’s not too high and not too low. The cool thing about these is that you can wear them tall or scrunch them down and wear them slouch style. Color : Golden Caramel Suede. I love wearing my black leggings with these light-colored boots, makes a great contrast. DETAILS : One of my favorite boots from the entire sale are the sleek over-the-knee boots. They are slim and hug your leg without being constricting. The pointy toe elongates your leg, but the heel is on the shorter side and slightly chunky so you won’t feel inappropriate wearing them for all occasions. I prefer a little skin to show when wearing these boots with a skirt or dress. FIT : Whole sizes only, if you are between sizes, go down half. The tall Hunters are too long on me at 5’1, so I think they’re better suited for ladies 5’3 and above. DETAILS : If you’ve never had a proper rain boot, I promise when you get them, you’ll be surprised how often you wear them and how useful they are. Even on days after the rain, I wear mine on muddy ball fields so I don’t ruin my shoes. You’ll save $50 on them now! FIT : TTS, but slightly narrow. 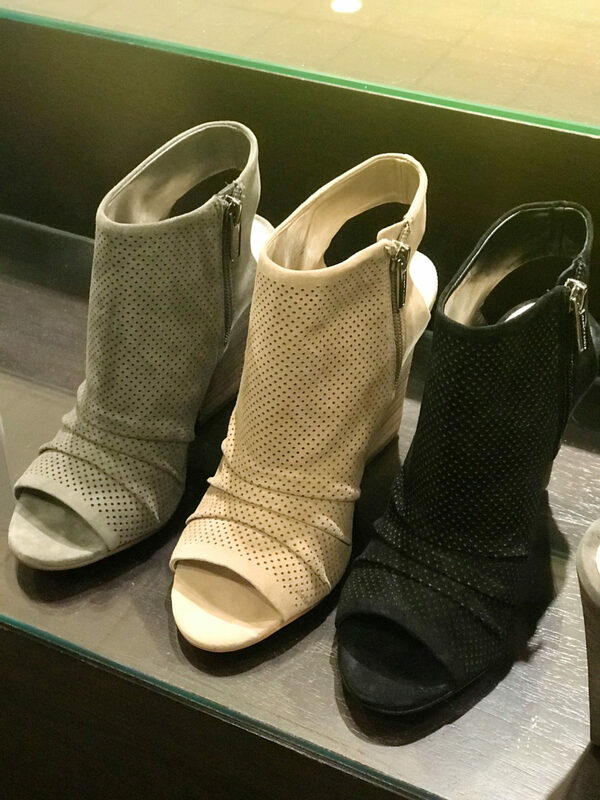 DETAILS : One of the most popular shoes in the sale, this wedge bootie is both adorably stylish and comfortable. I’ve already worn mine with jean shorts, but they also look wonderful with a casual t-shirt dress or jeans. The zip makes them very easy to get on and off- no laces to mess with. 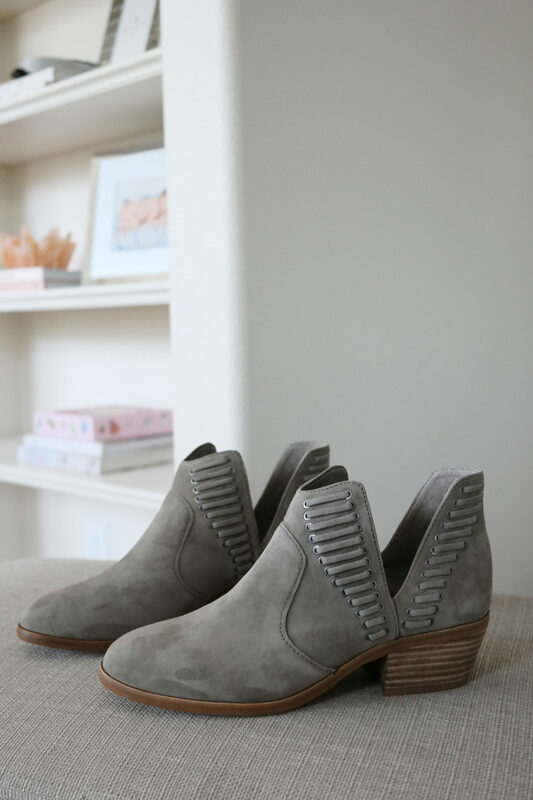 I think these booties are great for any age and the taupe color is pretty in person. 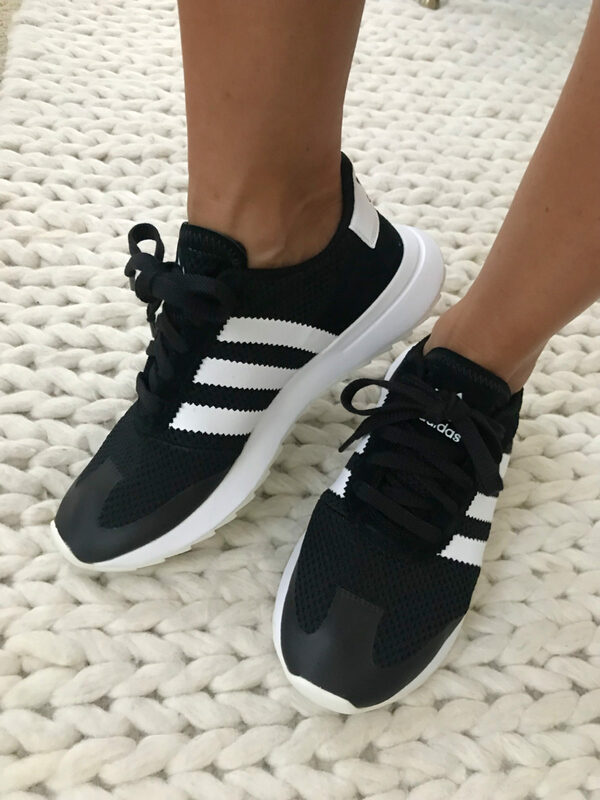 DETAILS : Aren’t these Adidas sneakers so cool?! 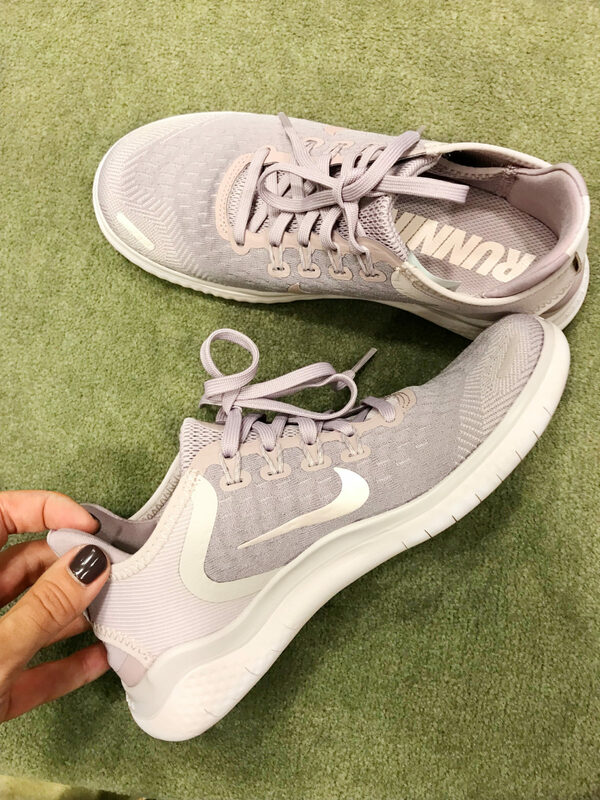 I’ll wear these for workouts, but also just casually on the weekends, running errands or to the grocery store. They are lightweight and cushiony with a wide toe box that feels great on a wider food. They also come in a pretty, light neutral color. DETAILS : The pretty purple/pink sneakers above are comfortable and good quality, but the TR8 is like “Oh My Goodness I Never Want To Take These Off” comfortable. 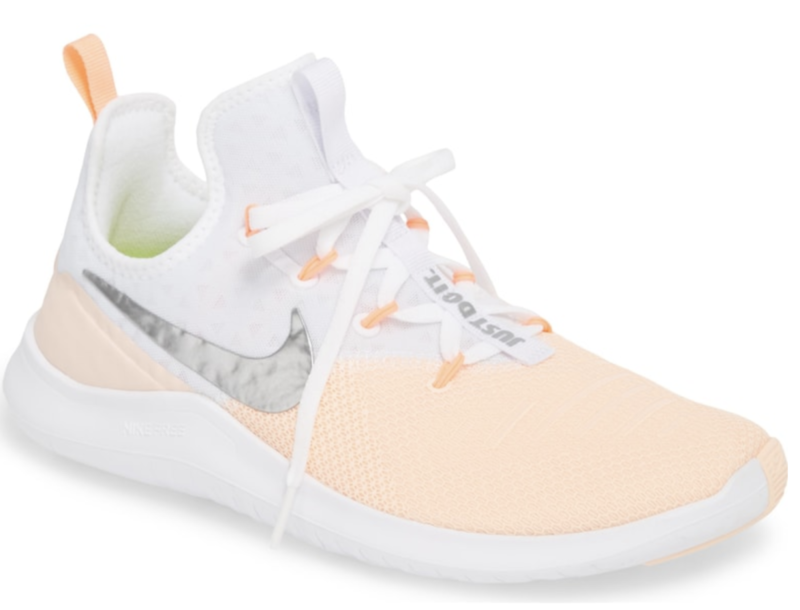 I have them in two colors, but only pure white and peach are included in the sale. 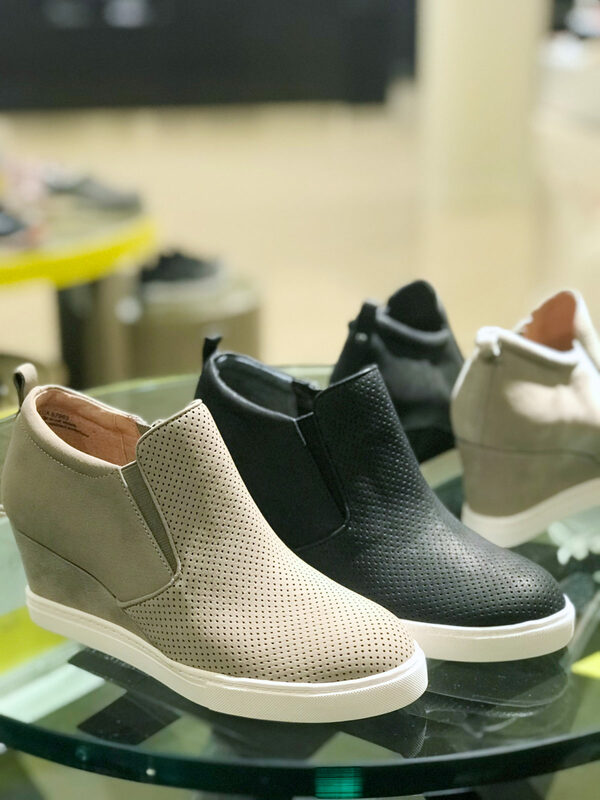 They are a specially made performance shoe with an ultra lightweight material, stretchy upper bootie with engineered mesh for a perfect fit. 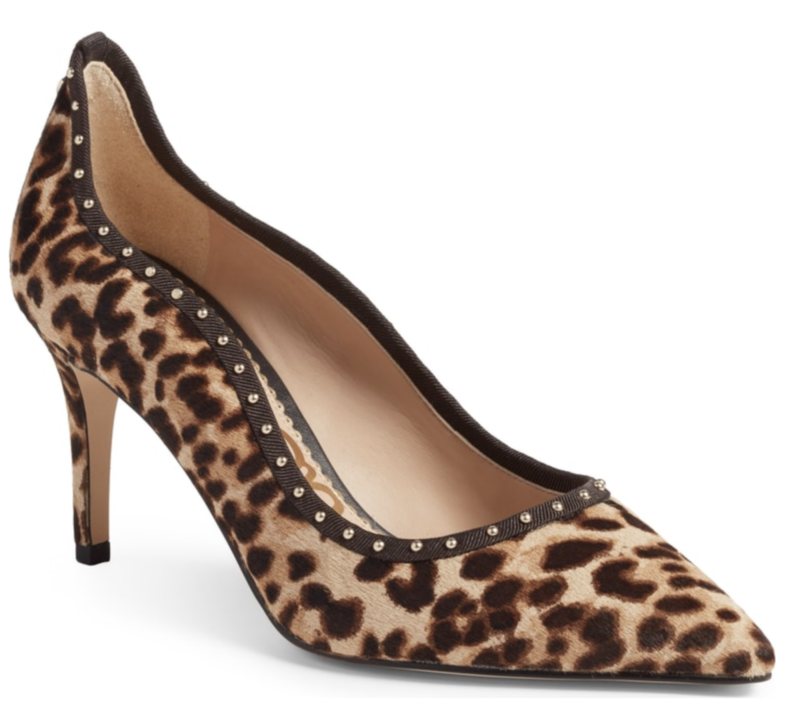 The studded leopard calf hair heels (FIT: TTS) and leopard calf hair flats (FIT: TTS) are definitely fun for the Fall too. 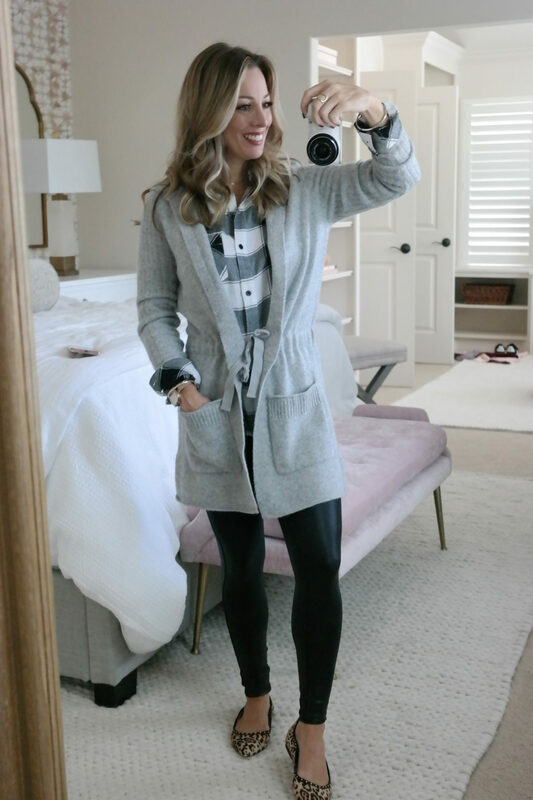 I ended up opting for the flats because I know I’ll get so much use out of them and can wear them anywhere from running errands on the weekends to play dates to church and out to lunch. 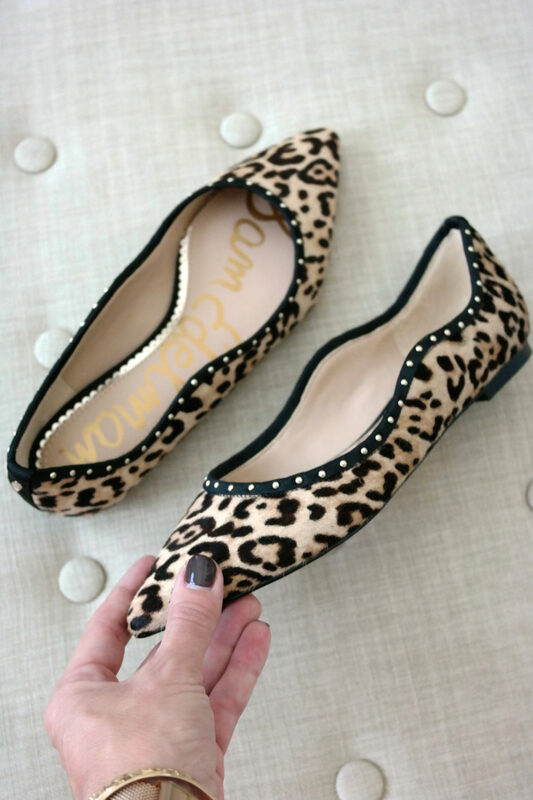 If leopard isn’t your thing, they also come in classy black and bold pink. 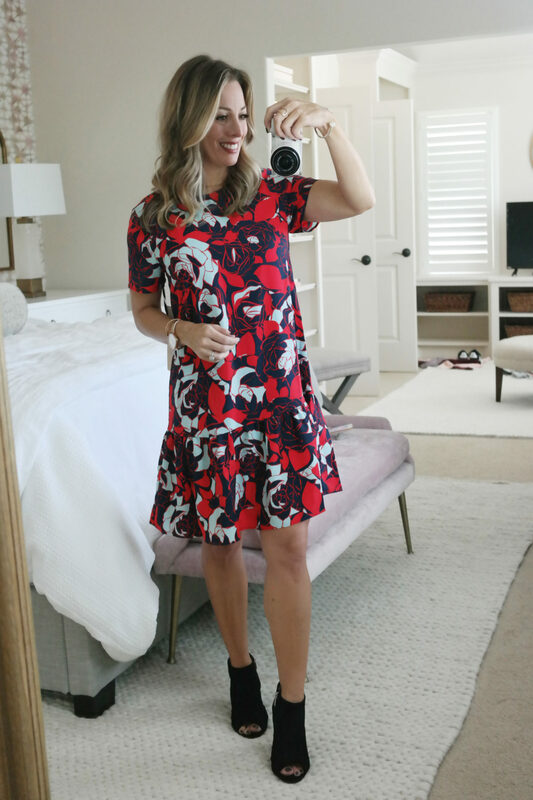 I hope this post was helpful when making your NSale shoe selections this year! Don’t forget, the Sale opens to the public tomorrow, so if they’re anything you want to scoop up before it sells out, today’s the day. Need a little help narrowing everything down? Below are my top picks! Yes, I’m wearing Greystone suede. 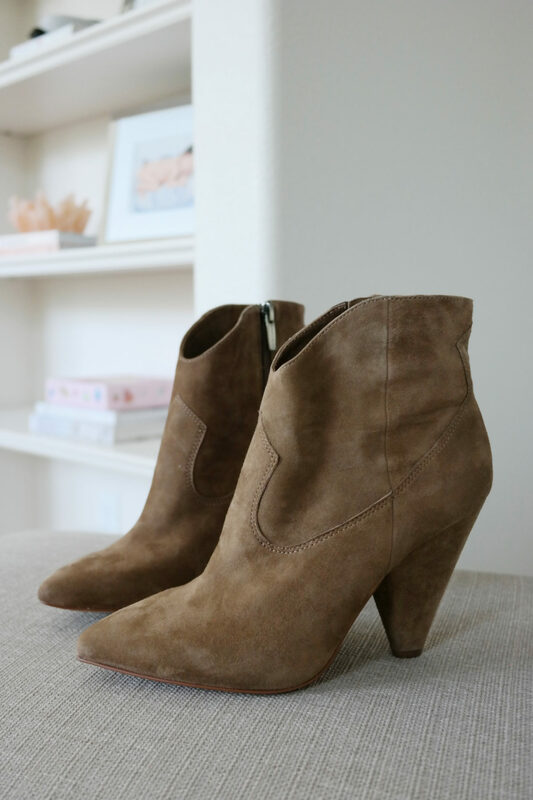 The Foxy Suede looked great in that bootie too and will go with everything! it looks like the link for the over the knee boots is wrong. it seems to be also linking to the dress in the photo. (i had to go search it by name). Thanks so much Jennifer! It’s fixed now! I legit bought 8 pairs of shoes. The Lucky Booties in black and olive. Tory Burch heels in Black and Wine. Then two pairs of Uggs, and the Addidas and Caslon sneakers in your post! I was like OMG…but I will honestly wear them all. The Tory Burch I wear daily at the office and that price you can’t even find at the Tory Burch outlet, so that was easily justified! Hope I am not the only one that bought this many! Hello! Thank you so much for all the Nordstrom Sale suggestions. 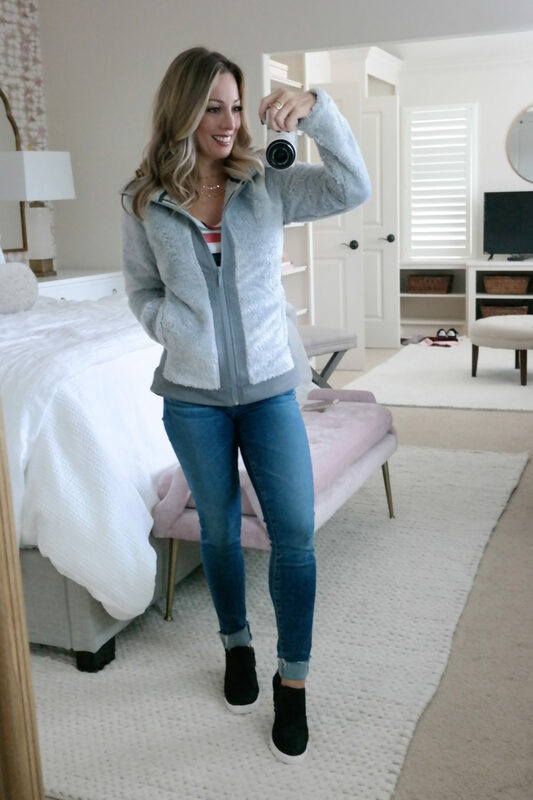 I am new to your blog and it’s saved me/us so much – the HWH Challenge was perfect, the Miracle Morning was an excellent read, sports bra recommendation awesome and we simply could not imagine vacation without those I-phone waterproof covers!!! Thank you, thank you!! I’m so glad you’ve gotten helpful tips here! That waterproof case has saved my phone in the pool! I’m really ready for another fitness challenge- I’m thinking September!